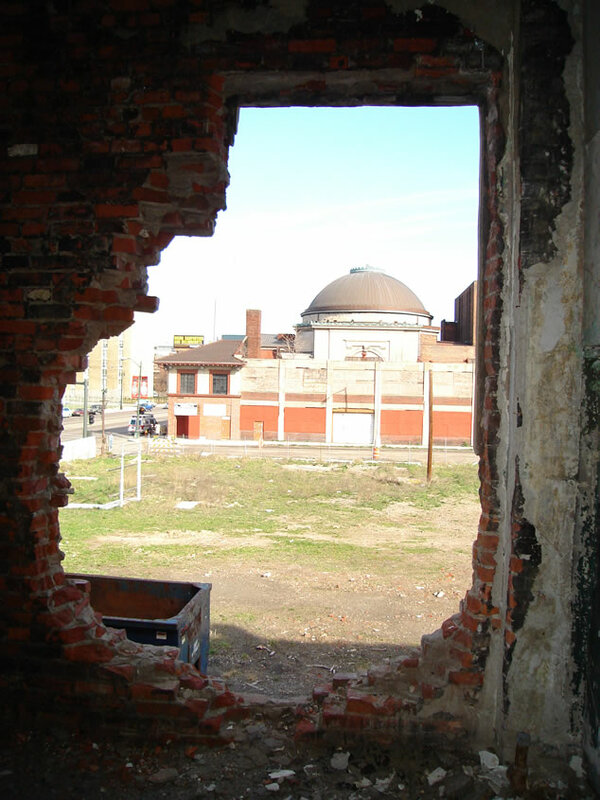 In 2005 or 2006 I decided to pop into this old ballroom at 3100 Woodward, shortly after the demolition of the Art School of the Society of Arts and Crafts that sat immediately behind it (David Kohrman also covered that building pretty well in his photo blog). This ballroom was also the first place where I started using a digital camera, which explains why some of the photos in this post are scanned from 35mm prints and some are digital. I have always seen this building referred to as the Crystal Ballroom (or the Mayfair Ballroom), but interestingly enough, the Sanborn map for this area shows this building (at 3100-3116 Woodward) marked not as the Crystal Ballroom, but as the "Majestic Dance Hall" (not to be confused with the Majestic Theater stands at 4140 Woodward). The book Before Motown: A History of Jazz In Detroit also notes that there was a "Crystal Palace" at 2769 Woodward near Temple Street (confirmed on the c.1921 Sanborn map), though it has been a vacant lot for a long time. 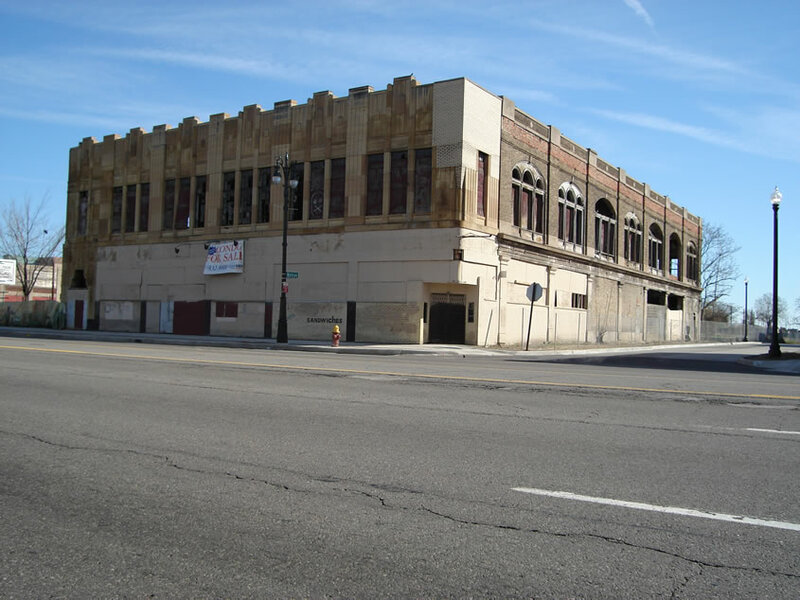 By searching for 3116 Woodward instead of 3100 Woodward, I was able to turn up mentions of a Mayfair Ballroom at that address (the Communist Party of Michigan apparently held a meeting there in 1940, which I explain in much greater detail in another post). The Michigan Manufacturer and Financial Record also names it the Mayfair Ballroom c.1938, and Polk's Directory for 1921 shows a "Majestic Institute for Dancing" at that address. So it sounds like this place has had a progression of names. A book by local historian David Lee Poremba mentions a "Majestic Ballroom" as a place where marathon dancing sometimes took place in the 1920s, and Before Motown also mentions a Majestic Ballroom. 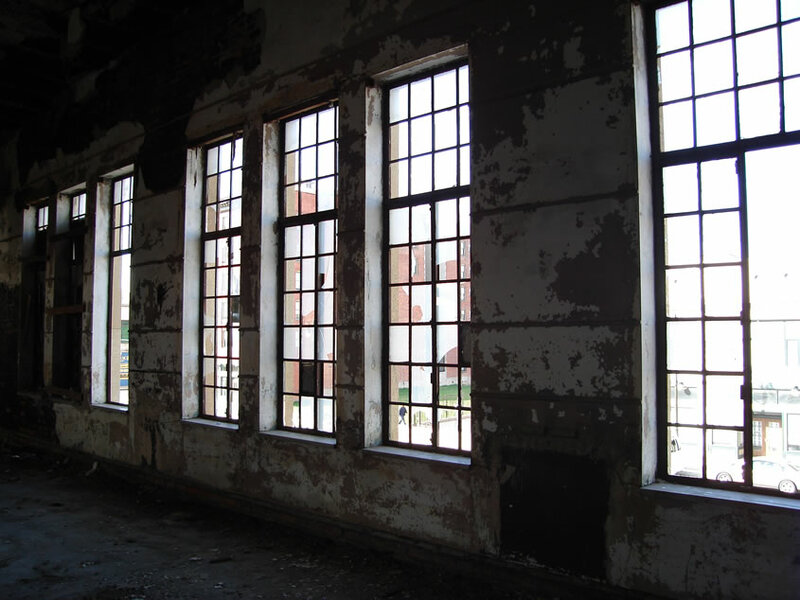 In the previous photo, you can see where the old Art School used to share a wall with the ballroom. By 2008 this building had been fully renovated, happily, and I later noted that lofts, and Ye Olde Butcher Shoppe were the new tenants. Ironically enough, YOBS has just gone out of business as I am typing this. Some would argue that Whole Foods put them out of business and I certainly won't stand in their way, but I don't think YOBS's management was trying too hard to succeed either. Apparently they subscribed to the "If you build it in Midtown, you will automatically get rich" mantra. 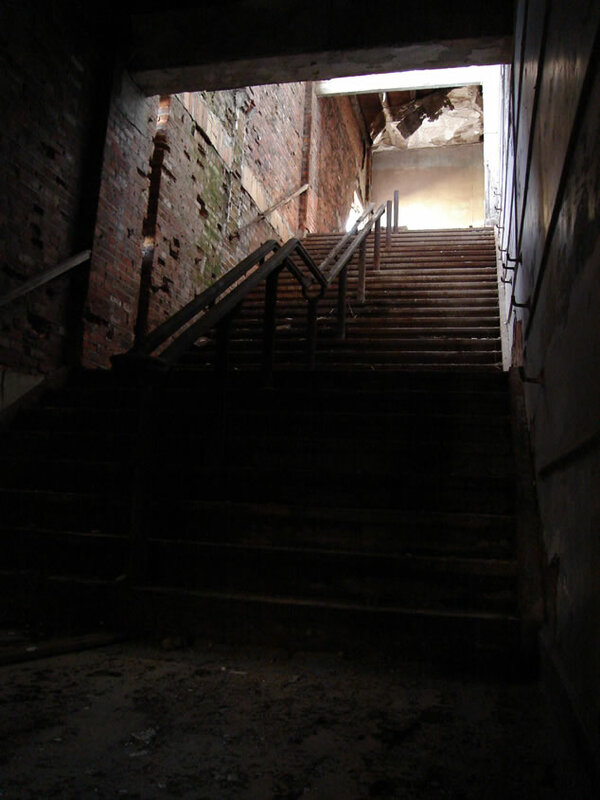 I entered on the Watson Street side, where the wreck of an old taxi (if memory serves) had recently sat in a junked heap. The whole interior was was pretty gutted and empty. I assumed that this was the former ballroom floor. According to local architecture guru Benjamin Gravel, this building was constructed in 1919, and designed by Bernard C. Wetzel for financier Hugh Chalmers (founder of Chalmers Motor Co.). Bernard Wetzel also designed many other buildings in town, including the Jackson Intermediate School, which I explored in another post. This building was heavily altered in the 1930s, hence the deco facade. The book Art Deco in Detroit, by Rebecca Binno Savage and Greg Kowalski asserts this was probably done during the Widening of Woodward in 1936, an event that characterized Detroit's rapid growing pains, and resulted in the demolition, modification--or moving--of many buildings on the city's main thoroughfare. 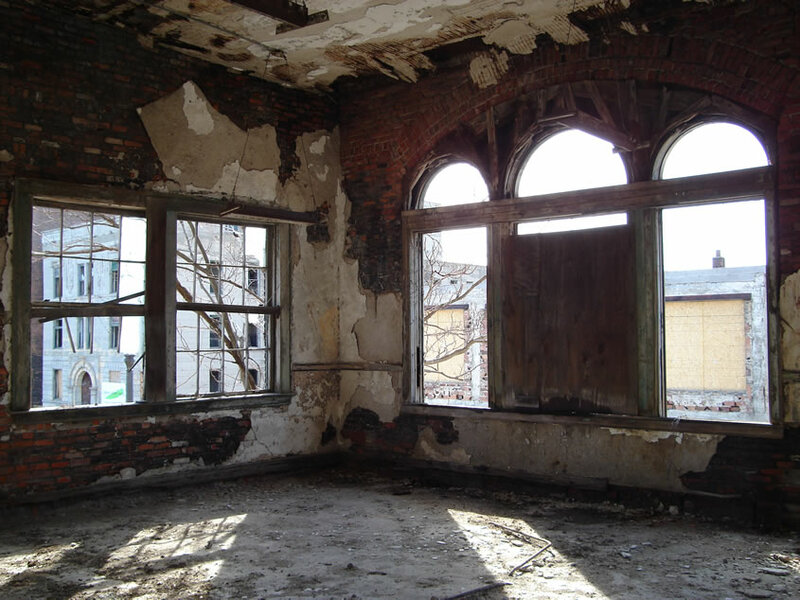 According to detroit1701, this was one of the first four big ballrooms that sprung up in Detroit prior to the 1920s, and it is also one of the few that remain. In fact, I think only three others survive today: the Campus Ballroom, the Vanity Ballroom, and the Grande Ballroom. 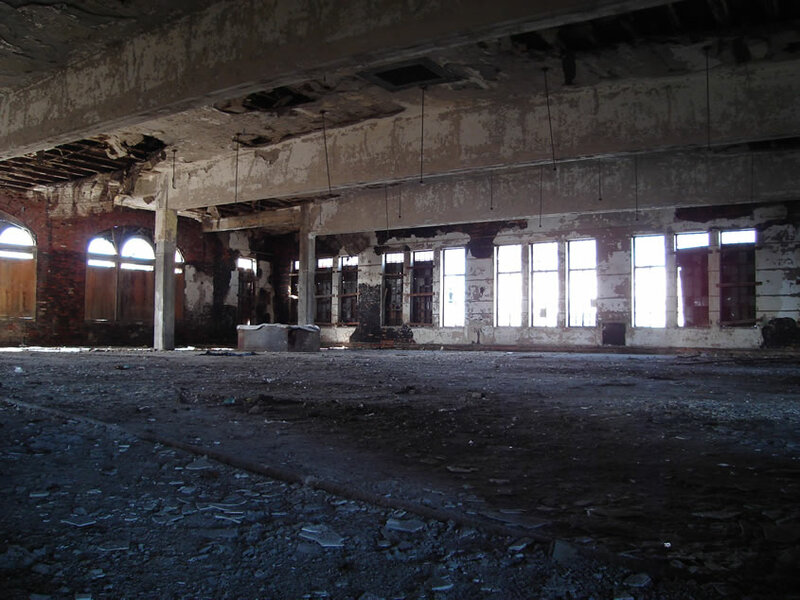 This ballroom and its earlier peers that were built around 1919 signaled the rise of a new prosperous middle class as a result of the burgeoning manufacturing industry here. 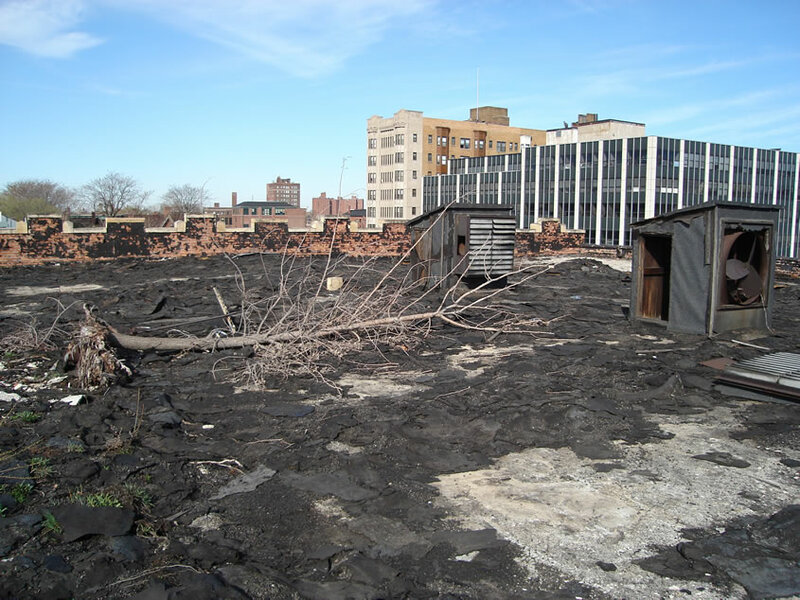 They were seeking more entertainment outlets, and as time went on this demand also played a part in Detroit's increasing role in the development of modern music. Binno Savage and Kowalski's book asserts that the Crystal Ballroom possesses Detroit's only example of this popular motif, but I have found at least one more example on the Chene-Ferry Market. 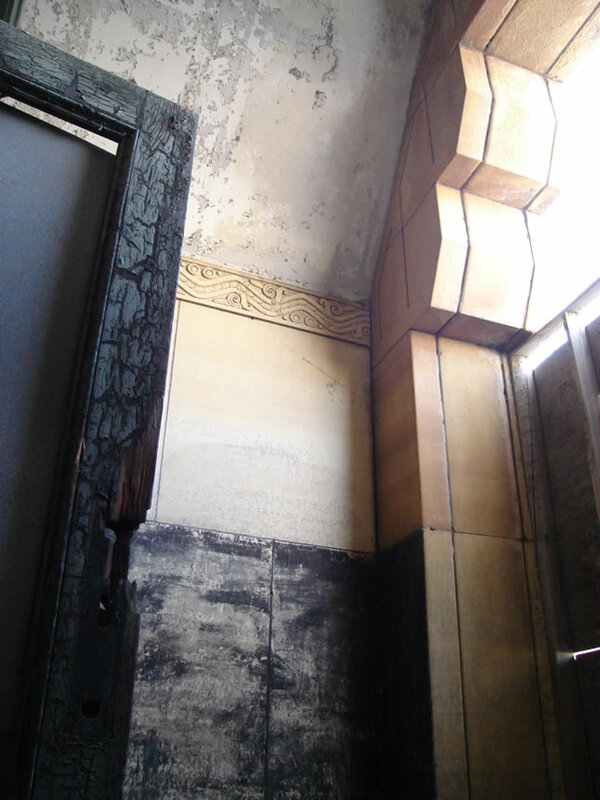 Just by looking at the building I would say it's a fair bet that Charles Agree or maybe even Wirt Rowland may have executed the 1930s facade-lift. 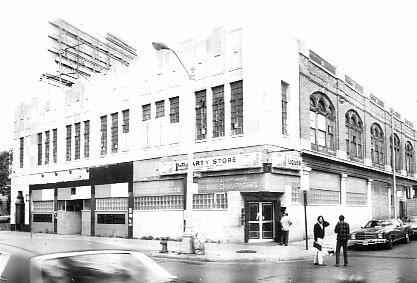 Again, Before Motown indicates that the Addison was the location of a cabaret in the 1920s. 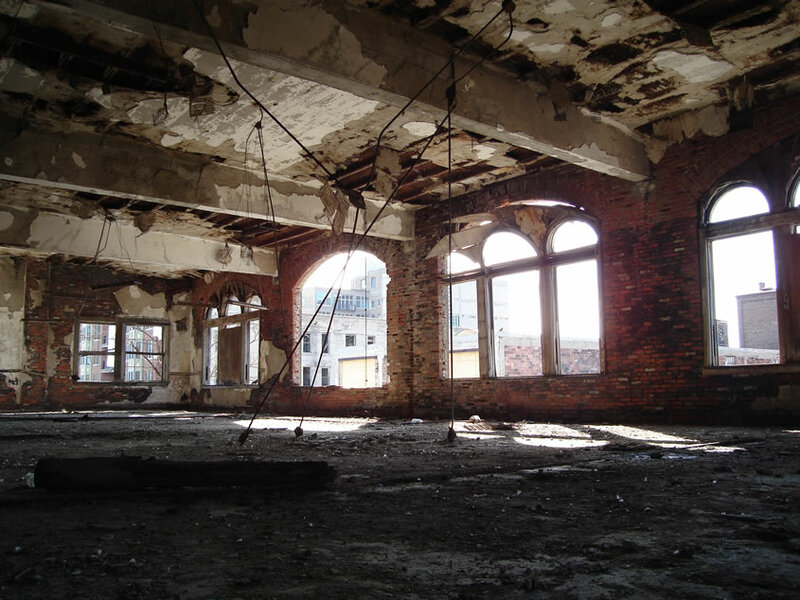 Other important Jazz-Age ballrooms in the central city included the Graystone Ballroom at 4235 Woodward, the Arcadia Ballroom at 3527 Woodward, and the Mirror Ballroom at 2940 Woodward, all of which are gone. A post at Atdetroit.net by "Leob" offers a "master list" of Detroit ballrooms. Thanks for posting about the Chene-Ferry market's frozen fountain plaque. I had never seen this detail on the Chene-Ferry market. Let me know if you find any others (on the building exterior.) 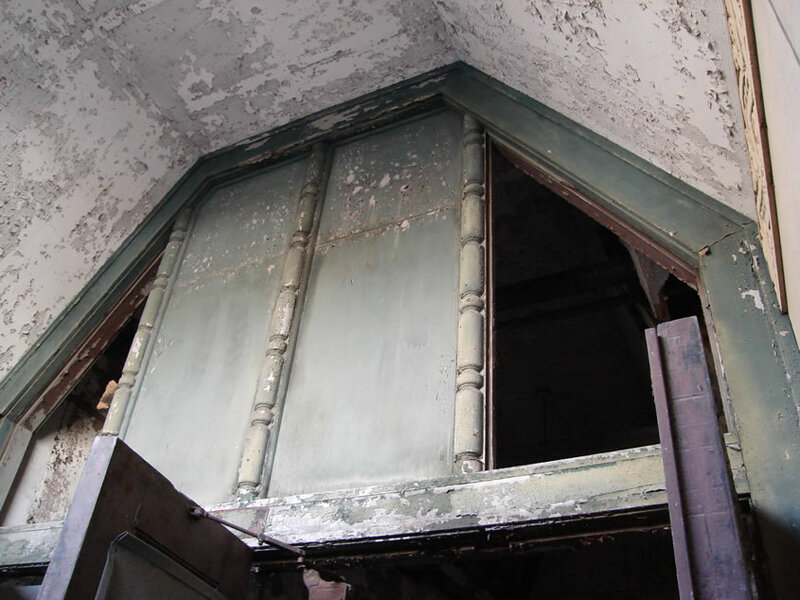 There are interior examples around Detroit - the Water Board Building for example. And lastly - thank you for your website. I enjoy your writing and research. Thanks for reading! I can't think of any other frozen fountains offhand, but I have a feeling there are some more less obtrusive examples still floating around out there. Secrets of Northville's "Evil Woods"